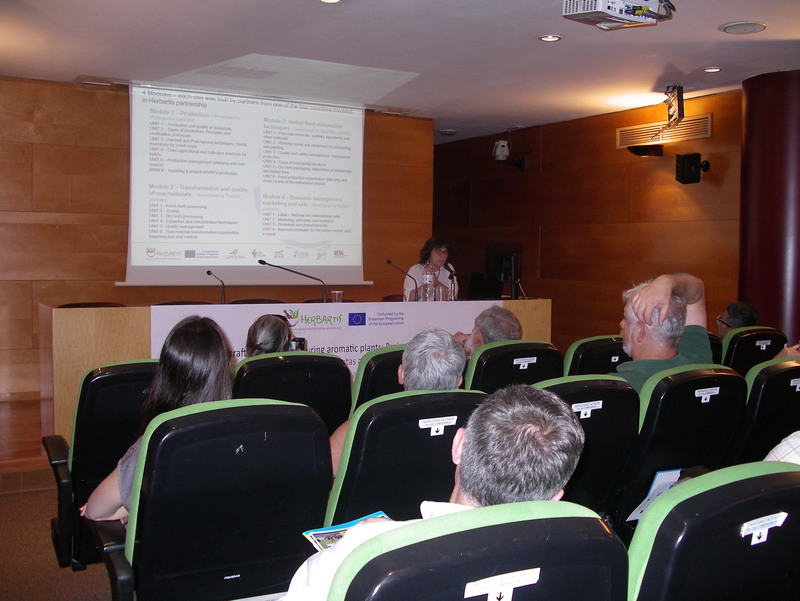 During 27th June 2017 took place in Barcelona the final event of the project ERASMUS+ HERBARTIS “Training for craftsmen manufacturing aromatic plants”. Seminar and Erasmus+ HERBARTIS project presentation. Mrs. Eva Moré, CTFC. Formal framework for HERBARTIS training: certifcate of professional qualification. Mrs. Manuela Merino, ICQP. Erasmus+ Good herbs – LifeCitrus Life+ project. Mrs. Ana Belén Morales, Agroofood Cluster Murcia. Leonardo Herbalmed.net. Mr. José Luis Moreno, SEAE. HERBARTIS pilot course: Handicraft production of herbal food products. Design of the syllabus and materials. Mrs. Christelle Aunac, UESS, and Mrs. Clara Lourenço, ADCMoura. Results of pilot course in Portugal. Mrs. Clara Lourenço, ADCMoura. Results of pilot course in France. Mrs. Christelle Aunac, UESS. Results of pilot course in Spain. Mrs. Eva Moré, CTFC. Results of pilot course in Italy. Mrs. Elena Cerutti, Terre dei Savoia. Presentation of the Guidelines of training methodologies and policy recommendations for the recognition of HERBARTIS training. Mrs. Barbara Ruffoni, CREA. Future of HERBARTIS course and possibilities for the training centres. Mrs. Eva Moré, CTFC.